Yevamot 118b ~ Does Marriage Make You Happier? In a 1975 lecture to the Rabbinical Council of America, Rabbi J.B. ("the Rav") Soloveitchik, quoted this aphorism of Resh Lakish found in today's Daf. The Rav went on to explain that it was "based not upon sociological factors...[but] is a metaphysical curse rooted in the feminine personality. This is not a psychological fact; it is an existential fact." Wow. Is this statement of Resh Lakish really an existential fact? To answer this, we need to first answer another question - what do his words actually mean? One way to understand the aphorism is as follows: "A widow would rather live in misery than live alone." But that's not the only translation, which depends on the exact meaning of the Aramaic phrase טן דו (tan du). There are a number of possibilities. Let's start with Rashi (and his explanation to the text in .כתובות דף עה). So according to Rashi, Resh Lakish never mentioned anything about living in misery. He just made the observation that women prefer marriage over a single life. Not so Marcus Jastrow, whose dictionary (published 1886-1903) became a classic reference text for students of the Talmud. Jastrow translated טן דו as a load of grief, an unhappy married life. This will become very important later, so make note. Melamed's Aramaic-Hebrew-English Dictionary (Feldheim: Jerusalem 2005) follows Rashi : "טן דו = two bodies." The ArtScroll Schottenstein Talmud basis its translation on Rashi, but adds a footnote that brings its meaning closer to that of Jastrow and the Soncino: "I.e a woman prefers even a less than desirable marriage over staying single." In his Hebrew translation of the Aramaic text, Rabbi Steinsaltz follows Rashi, and translates טן דו as "two bodies. "A side note points out that the true origin of the phrase is not known, though it likely comes from Persian. The newer English Koren Talmud follows the same translation: "It is better to sit as two [tan du] than to sit lonely as a widow, i.e., a woman prefers the companionship of any husband over being alone." The note, (written by Dr. Shai Secunda), is more definitive than the Hebrew note. Tan Du is from middle Persian, meaning together. It's nothing to do with being miserable. טן דו in Persian means two people. ארמלו means alone. Chronologically, this is our earliest source, and, therefore, perhaps our most compelling. Case closed. ...in a less desirable marriage than no marriage at all (ArtScroll footnote). ...miserable and married than to be a widow (Soncino). What if Tan Du Means Miserable? It seems that the translation of טן דו as miserable originated with Jastrow, and that those who translate Resh Lakish as saying "misery is better than being single" are following in the Jastrow tradition. If we were to evaluate the Resh Lakish Rule per Jastrow (and Soncino and an ArtScroll footnote), the question is, what, precisely, constitutes a "miserable marriage"? One in which the woman feels physically safe but emotionally alone? One in which her husband loves her dearly but is unable to provide for her financially? Or one in which she has all the money she needs but her husband is an alcoholic? Tolstoy has taught us that each unhappy family (and presumably each miserable marriage) is unhappy in its own unique way. The point here is not to rank which is worse. Today it would be utterly silly (and incredibly rude and insulting) to suggest that a woman is better off miserable than single. But after our review, that does not appear to be what Resh Lakish ever said. What he really said was this: a woman would be better off (טב) married than living alone (as a widow). Resh Lakish didn't explain what he meant by better off, so we will have to assume that what he meant was a measure of overall well-being, or what we call... happiness. What we want to know, is how this understanding of Resh Lakish stands up today. Was the Rav correct when he called this "an existential fact"? But why is this so? Don't we all oscillate around a set point of happiness, regardless of what life may throw at us? Some psychologists think so. Married people are – on average – happier than those who are single, but perhaps this fact does not suggest causation. Some would argue that it's just a correlation. A grumpy person, unable to hold down a job and miserable to be around, is not likely to find another individual willing to marry him. So it’s not that marriage makes you happier –it’s that happier people are more likely to find a partner and get married. According to this set point theory of happiness, the Resh Lakish Rule would not be supported, since the act of marrying would have no overall long-term effect on happiness. However, evidence from a 15 year longitudinal study of 24,000 people suggests that "marital transitions can be associated with long-lasting changes in satisfaction." This would support the claim that marriage is causally related to happiness. It's not that you went from being a happy person who was once single to being a similarly happy person who is now married. What actually happened was that the marriage had an effect on just how happy you became. And data from other large cohort studies show that happiness increases when people marry. Just look at the happiness of women by marital status in the figure below. Was Resh Lakish onto something? 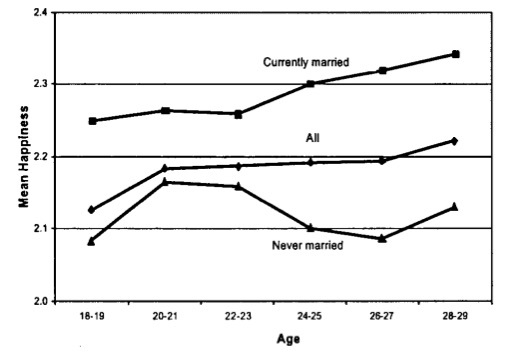 Mean happiness of women by marital status, birth cohort of 1953-1972, from ages 18-19 and 28-29. From Easterlin, RA. Explaining Happiness. Proceedings of the National Academy of Sciences 2003. 100 (19): 11176-11183. All this supports the Resh Lakish Rule that people are happier when they are married. (I say people because all the evidence applies equally to men too.) But we can get even more specific, because Resh Lakish used the word ארמלא, which most likely means widowed (and hence has a secondary meaning of being alone). There is actually data that applies to this more specific Resh Lakish claim about widows, and it comes from The Roper Center at the University of Connecticut. From Economics and Happiness, ed Bruni L. Oxford University Press 2005. As shown in the table, 62% of women who are widowed want to be happily married. (Of course this also means that about 40% of widowed women would rather not be married - even happily. That’s a huge proportion. Still, the overall finding still supports the Resh Lakish Rule.) The women's perspective is the most important perspective in this conversation, and when women (widows) were asked, most wanted to be married again. Widows indeed wish to live as two rather than live alone. I don't think this amounts to anything like an existential fact, as claimed by the Rav. But the evidence from the social sciences would certainly support the Resh Lakish Rule.